The book is divided into chapters with prayers for different stages of life and different needs: spiritual growth, healing, children, marriage, peace and unity. And while the book has no specific prayer for Baha’i prayer beads, I have pulled out some that I think would work on all sorts of prayer beads – Catholic, Anglican, Pearls of Life, malas and subhas for sure. Here are some that I have been using this last week. If the antiquated language bothers you, trade out the “thees” and “thous” for something more modern. Mix ’em and match ’em on whatever set of beads you use. Oh God, guide me, protect me, make of me a shining lamp and brilliant star. O God, give me a new life at every moment, in order that I may remain steadfast in Thy love. Make firm our steps, O Lord, in Thy path and strengthen Thou our hearts in Thine obedience. 4) I lay all my affairs in Thy hand. 5) Thou art my Guide and my Refuge. 6) I will no longer be sorrowful and grieved; I will be a happy and joyful being. 7) O God! I will no longer be full of anxiety, nor will I let trouble harass me. 8) I will not dwell on the unpleasant things of life. 9) O God! Thou art more friend to me than I am to myself. 10) I dedicate myself to Thee, O Lord. All of these prayers are attributed to ‘Abdu’l-Baha. He was the son of the founder of the Baha’i faith, a man named Baha’u’llah. It was a pleasure to meet you at the Religion Newswriters Association convention a few weeks ago. 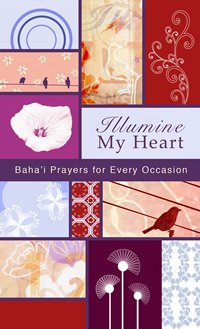 I’m so glad you are enjoying the compilation of Baha’i prayers you picked up at our booth. I love your suggestion of pulling out portions of the prayers for use with prayer beads! As you explained in your post about Baha’i prayer beads, Baha’is repeat the Greatest Name, “Allah-u-Abha, ” which means “God, the All-Glorious,” 95 times. Now that I’ve seen your post, in addition to “Allah-u-Abha”, I may use my prayer beads to do a round of prayers as you suggest above — thanks for the inspiration! I’m glad you were able to visit the Baha’i booth. “Oftentimes in life, tests and difficulties are the motivation to pray. A prayer often learned early on by new Baha’i’s and Baha’i children is the Bab’s Remover of Difficulties. That too, some come to a convention or practice of repeating nine, nineteen or ninety-five times, in times of exceptional challenge. A personal choice of mine was to repeat the Tablet of Ahmad nineteen times daily. Indeed, for many years, in addition to the Fast prayers, I would say it nineteen times each day for the nineteen days of the Fast. Each one must find their own discipline and it is well to remember that Baha’u’llah CAUTIONS about being given to long prayers. I realize these post are very old, but as someone new to the Baha’i faith, but well educated on many other faiths I am finding these old discussions very useful! Thank you so much for having them & keeping them up. I am using prayer beads for the first time in my own spiritual practice, and find such joy in them that I am giving gifts of some to Baha’i friends for Solstice.